Technical and semantic metadata about moving images, sounds, and timed text; embedded in files or externally centralized. Sentence example: Their system uses media ambits to automate ingest and delivery. Variations: Video Ambit, HDR Ambit, Audio Ambit, Timed Text Ambit, etc. Human intervention cannot be excluded. 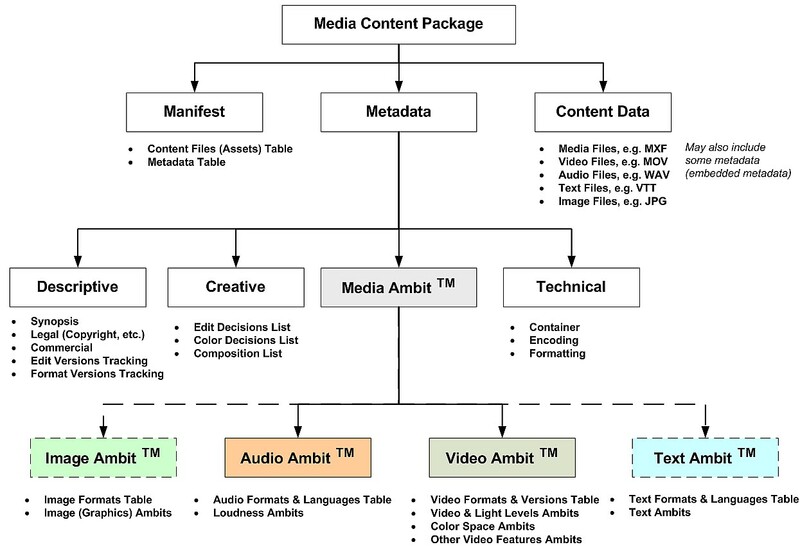 Media Ambits are at heart of any modern Automated and Automation-Assisted Workflow. critical parameters affecting the subjective estimation of AV content quality. Traditional professional image & sound QA/QC methodology, based on the usage of large number of high grade video & audio monitors, etc, is no longer the answer, but we learn that QA/QC is still needed. In this automated environment a smaller number of human operators should focus only on optional final checks and/or complicated cases. And these operators must be equipped with appropriate software tools and indicators presenting all relevant parameters in a time-saving “easy to spot at a glance” way. logistics chain is in state of boom. Our involvement in this process is through development and deployment of sophisticated modular software products that can gather, generate and apply technical metadata from video, audio, captions, and images to facilitate automation at every stage of the workflow. These special cross-platform enabled modules are uniquely designed to scale in accordance with customer needs and resources, and flow through machine friendly constructs, while being human readable when desired. These modules share common metadata format, which facilitates the interoperability between the modules as well as interaction with other tools used within the processes. It is of paramount importance that processes have sensors within the workflow steps to provide necessary feedback and allow systems, as well as humans, to make optimal decisions based on objective data rather than on perception of skilled individual. The foundation for such decision making is proper toolset, along with processes, that can easily provide, compare and check the outcome reliably, consistently, and at all times. Previous PostPrevious Welcome to VideoQ Tech Blog!